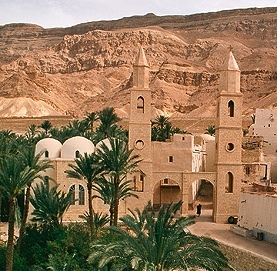 The following video (about an hour) is a BBC production documenting the journey of Father Peter Owen-Jones, an Anglican priest, to the monastery of St. Anthony in the Egyptian desert. Father Peter is going to the desert where “there’s no escape, there’s no distraction” and we face and deal with our “issues.” He will live alone in a cave for three weeks under the guidance of Father Lazarus, a hermit who lives in solitude on the Mount of St. Anthony. Father Lazarus offers wisdom that is applicable to us all whether we dwell in the desert or the city. First he reminds Father Peter that unless he is conscious of his sins and has some sense of repentance the cave life will be useless, without meaning. Second, he says that Father Peter is there to bless the world by prayer; not by a long list of names but by being awake in the spirit, awake to his soul. This wakefulness is, Father Lazarus says, a blessing to the world in itself. I saw this video a few months ago and enjoyed it very much. Fr Peter’s naivete is annoying at times but I would be hard-pressed to repeat his desert experience. A trip to Mt Athos would probably be more my speed. I would also like to visit Mt. Athos. It is not anything like what Father Peter did but I try to be a frequent guest of Lebh Shomea in the desert of south Texas, http://www.lebhshomea.org. I like to go to Mt.Athos too. It’s my life.